At the beginning of August, we had an early birthday celebration for the bf at Umami Burger. Although I used to live in LA, I'm ashamed to say I never tried the L.A.-based chain while out there. Fully aware of all the local media frenzy and anticipation for Umami's late July opening in NYC, we were prepared to put in some decent waiting time for a weeknight dinner. Luckily enough, one of our very kind friends went early at around 6pm to put his name down for our group of 5. He was quoted 45 minutes, but the wait actually turned out to be 2 hours. The restaurant had only been open for a week at that point though, so I assume they now give more accurate time estimates for table waits. Plenty of people milling about while waiting for tables. Soon after there was a pretty serious downpour. Everyone then sought refuge here under the neighboring shop's awning. 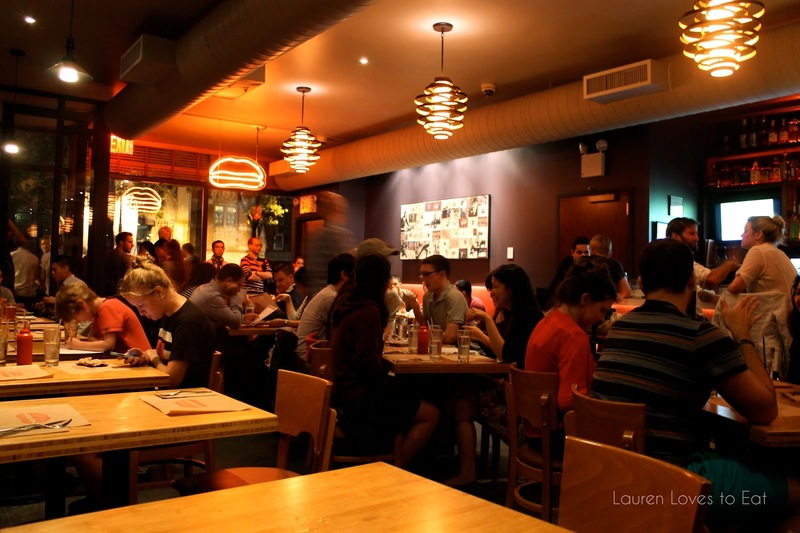 The bustling dining room gets pretty noisy. Probably not the best place for a first or second date. The Original, $12: Parmesan crisp, shiitake mushroom, roasted tomato, caramelized onions, house ketchup. 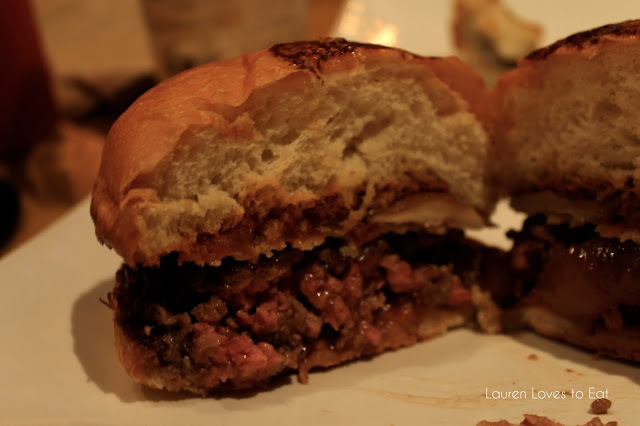 The patty was excellent-- superbly juicy and with perfectly charred edges. The thin and round parmesan crisp was a unique way of including cheese in the burger, and I was surprised to almost like it more than melted cheese. It offered a different kind of texture, and allows one to concentrate on the beef blend. The shiitake mushrooms were also a heavenly addition, while I barely noticed the roasted tomato (not entirely sure why this healthy addition was even there!). 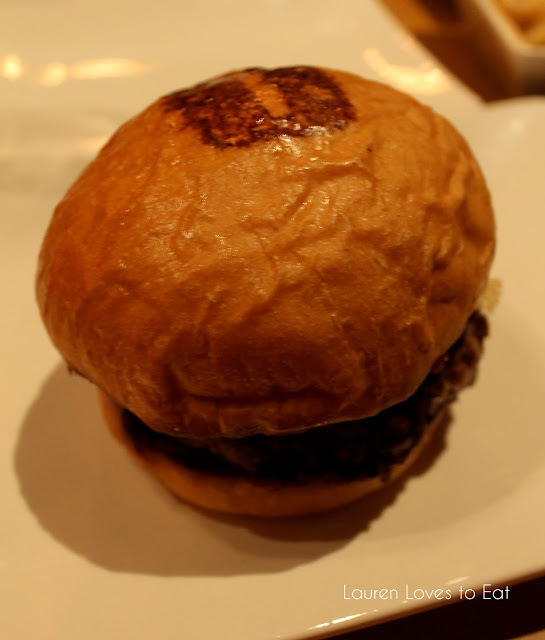 Truffle Burger, $12.50: roasted garlic aioli, house truffle cheese, truffle glaze. Surprisingly, this burger had a much stronger cheese flavor than truffle. It smelled very strongly of truffle, but didn't taste it. 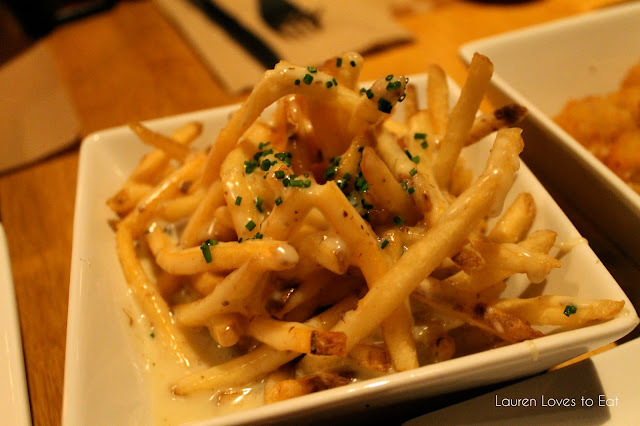 Truffle Cheese Fries, $5.50: I'm always happy with skinny fries, and adding cheese and truffle salt to them? Even better. 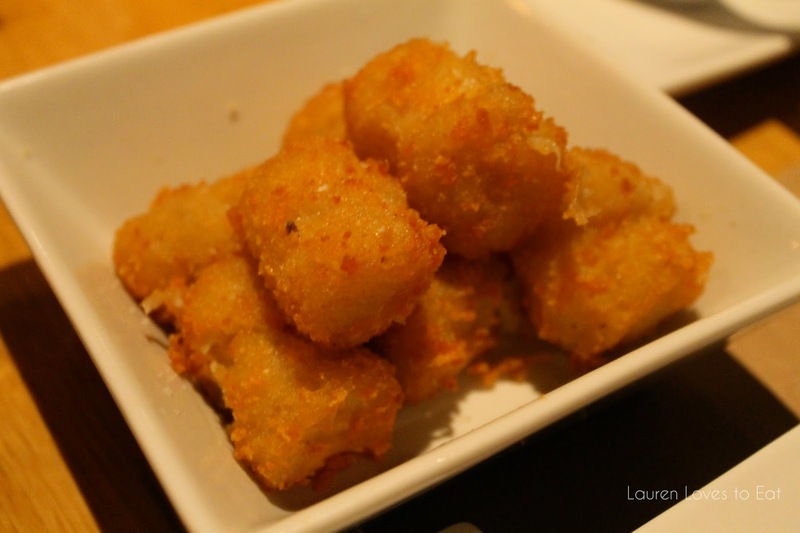 Cheesy tots from the secret menu. Very cheesy but it unfortunately did not have that freshly fried crispiness. 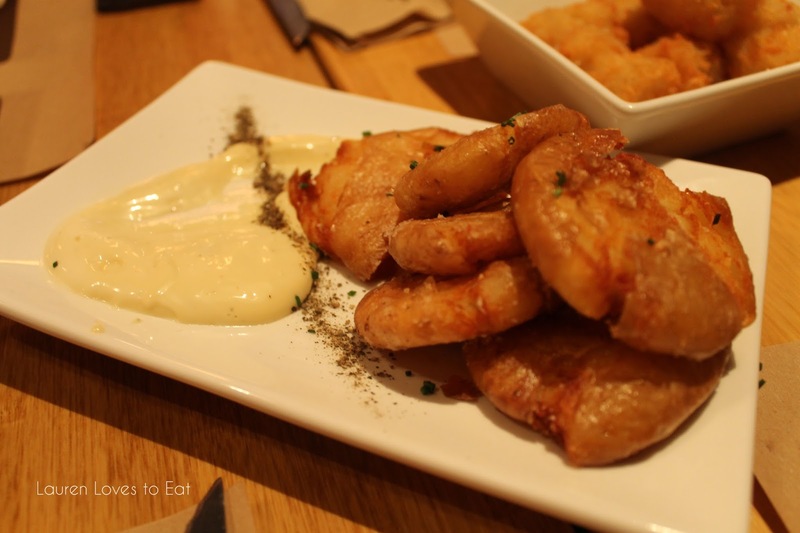 Smushed Potatoes, $4.5: double fried creamer potatoes with roasted garlic aioli. This is a great side if you want to focus on the flavors of the the various sauces that Umami gives. These potatoes were slightly crispy and very mushy inside. Delicious. 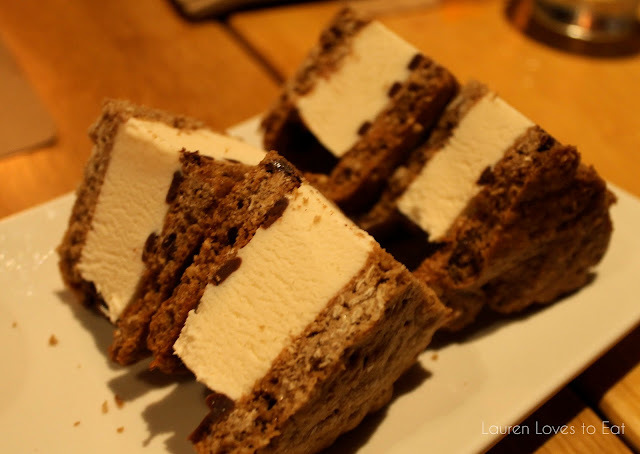 Desserts were presented on a mini chalkboard, and once we saw the choices (ice cream from Blue Marble or ice cream sandwiches from Brooklyn-based The Good Batch), we knew we had to go with ice cream sandwiches ($8). Each quarter had a great ratio of ice cream to chocolate chip cookie. I like when the ice cream reaches the edge of every cookie, so every bite will include ice cream in it. The cookies were dense and held the ice cream together well. 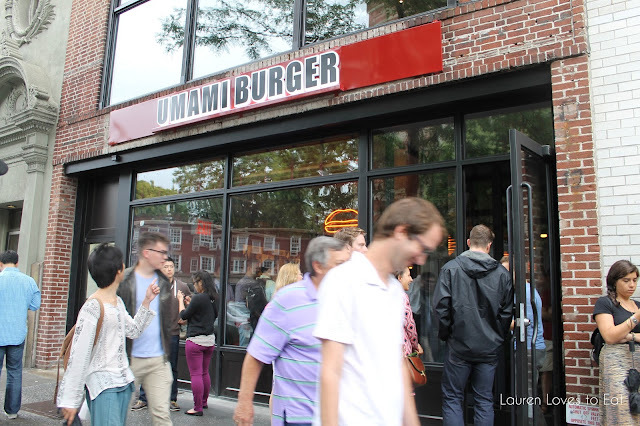 The burgers at Umami are definitely very good; especially for being in the $15 and under range. Yes, they don't include fries, but the specialty fries are a treat and worth the additional cost. I wouldn't say the whole experience was worth the 2 hour wait, but I'm sure as the hype and excitement over Umami calms down, I will for sure be going back.